The grapes used in Orvieto DOC wines are Trebbiano Toscano (Procanico), Verdello, Grechetto, Drupeggio and/or Malvasia Toscana. Malvasia is limited to a maximum of 20%. For a full directory of Italian grape varietals, click here. White Orvieto wine is one of the major Umbrian wines. The vines that are used for the production of this wine are Procanico, Verdello, Drupeggio, Grechetto and Malvasia, and the area where white Orvieto DOC wine is produced includes the towns of Orvieto, Allerona, Alviano, Baschi, Castel Giorgio, Castel Viscardo, Ficulle, Guardea, Montecchio, Fabro, Montegabbione, Monteleone d’Orvieto, Porano (in the province of Terni) and Castiglione in Teverina, Civitella D’Agliano, Graffignano, Lubriano, Bagnoregio (in the province of Viterbo). There are two principal types of white Orvieto wine, "Orvieto" and "Orvieto Classico", depending on the specific area where the wine has been produced. Thanks to the high-quality methods of production adopted, in 1998 two local wines were awarded DOC. 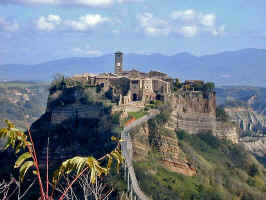 Further south, on a high tufa cliff, stands Orvieto itself. Among Umbrian wines, Orvieto is the most representative and accounts for about 70% of the entire DOC production in the region. Orvieto is made from Trebbiano grapes (50-65%), Verdello (15-25%) and Drupeggio, Grechetto, Malvasia (20-30%) and in addition to the two distinctions Orvieto and Orvieto Classico, it is produced in three classes, dry, semi-sweet and sweet. There is also a sweet wine made from late harvests in which the grapes have been attacked by the "muffa nobile" (noble mould). DOC Rosso Orvietano or Orvietano Rosso red wine is very recent. In addition to these appellations, there are Bianco di Torgiano, Rosso and Rosato di Torgiano, Chardonnay di Torgiano, Pinot Nero and Pinot Grigio di Torgiano, Riesling italico di Torgiano, Cabernet Sauvignon di Torgiano and Torgiano spumante, produced with the classic method in the bottle. For the territory of Montefalco: Montefalco Bianco and Montefalco Rosso: the former with Grechetto and Trebbiano, the latter, based on Sangiovese, with a small addition of Sagrantino (15%). The "Riserva" version of the Rosso is interesting. The basic vines are Cabernet Sauvignon, Merlot, Pinot, Sangiovese, Cabernet franc, Canaiolo, Montepulciano and Ciliegiolo. Among the secondary vines are Colorino and Dolcetto. In the northern part of Umbria, from Città di Castello to Gubbio, from Umbertide as far as Perugia, are the red, white and rosé wines of the DOC Colli Altotiberini, traditional wines that do not differ significantly from those of the DOC dei Colli del Trasimeno. The whites are based on Trebbiano with Malvasia from Chianti, Verdicchio and Grechetto, whilst for the reds Sangiovese is blended with Ciliegiolo, Merlot, Gamay, Barbera, Montepulciano and other white grapes. As far as the DOC "Assisi" is concerned too, there are wines made from Sangiovese and other black grapes, with the addition of a small quantity of Merlot. In the DOC "Lago di Corbara" the vines used are quite innovative: Cabernet Sauvignon, Merlot and Pinot Nero. These grapes are made into wine in their unblended state or in combination with Sangiovese to obtain the more classic Rosso. In the DOC "Assisi" there are also two white wines: Grechetto, unblended, and the Bianco (Grechetto and Trebbiano). As one approaches the "Heart of Umbria", the red wines become more structured. Along the Tiber valley is Todi and the DOC Colli Martani, the compostion of which is specified as a blend of Trebbiano, Sangiovese and above all, Grechetto, which, unblended, represents the authentic oenological jewel of this district. Like the Colli Martani, the Colli Amerini also boast a special wine: Malvasia.